Like father like the son goes the proverb meaning like father the son too tends to follow the footsteps of his father. The film industry has many examples like Rishi Kapoor and his son Ranbir Kapoor, Dharmendra and Sunny Deol the list is long. Bhushan Kumar, son of Gulshan Kumar, who founded T-Series Music Company is yet another example testifying the above idiom. Bhushan Kumar these days is making waves in Bollywood like his father in the 90’s. 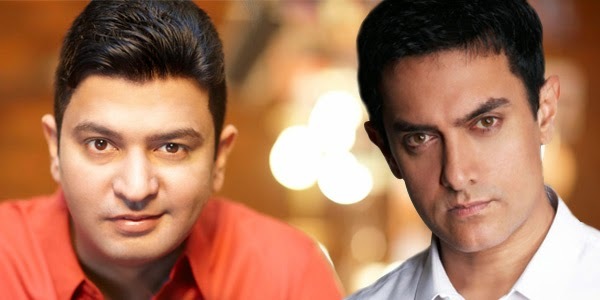 After reaping rich dividends from the music rights of movies like YAARIYAN, HIGHWAY, QUEEN, 2 STATES and minting gold in film production with NAUTANKI SAALA, AASHIQUI 2 AND BHOOTHNATH RETURNS, Bhushan Kumar has yet again made headlines by acquiring the music rights of all the three Khan’s forthcoming movies in Bollywood. In the first case T –Series has acquired Rajkumar Hirani’s much anticipated movie of 2014 PK starring Aamir Khan and Anushka Sharma. Rajkumar Hirani with his reputation of Munnabhai series has created more excitement among the viewers. Further with Aamir Khan being a part of the film, the movie is bound to create hungama at the box office. Bhushan Kumar, an ace business tycoon has sensed the craze and has hence acquired the music rights of the movie at an undisclosed mammoth price. Besides acquiring music rights of Aamir Khan’s PK, T-Series has also bought the music rights of the two other Khan’s forthcoming movies viz. Shah Rukh Khan's 'HAPPY NEW YEAR' and Salman Khan's 'KICK'.